Sunday, 8 August - 0900-1400: The bus tour of the city included the new modern port area with its high rise hotels left unfinished. 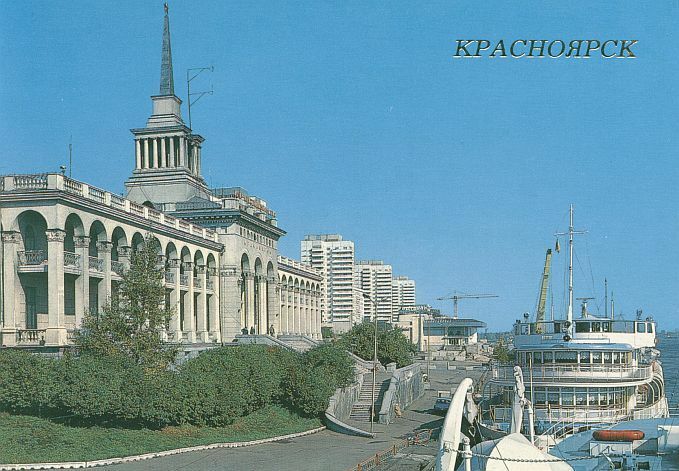 There was a very modern building for theater and opera. Another large building housed the maritime museum. It was closed, but we were able to see a beached museum steam ship and its sidewheel paddle. The bus took us to the top of a hill that overlooked the city and river. We could see for miles from this point. There was what looked like a round lighthouse. It was a very small Russian Orthodox church. It had been sealed up since the 1920's. It was open to the public, although it was being renovated. At another hilltop location we visited a much larger Orthodox church. There was a service going on inside. Not sure what happened, but one of the local church members started telling one of our group to leave; and perhaps said other words as well. Surrounding this church was a cemetery. Like the church, this was being cleaned up and renovated. We walked around many walkways. Each small plot of land was surrounded by fences or short walls. There were stone markers in some, tablets in other and some had elaborate carved figures. While many had the Russian Orthodox Cross, many others had just the simple hammer and sickle of the Communist (Atheist) Party. This was really an old and very large cemetery. Our guide took some of the Polish people to a slab laying on the ground near a row of other markers. She asserted that this was from a Polish grave. She had no idea where the actual grave was. The people looking on had mixed emotions about this grave marker. Some had tears in their eyes. A few were outraged that Polish people were so badly treated in Russia. One woman wanted to know when they were going to put this marker back over the grave of the Polish person. The guide responded that no one even knew from where the marker came. After the people left it, I looked to see what they were discussing. The lettering was hardly discernible. Danuta told me that just after 1939, when the Russians invaded eastern Poland, they transported thousands of Polish men to this area. Here they were virtual slaves working for the Russians. It was from this and other work sites in Siberia, that most of the Polish soldiers who fought at the Battle of Monte Cassino in Italy, WW II, were enslaved. After Hitler invaded Russia in 1941, Stalin ordered those Poles release who desired to join the Polish Divisions within the Russian Army. As it turned out, these Poles were ignored by Stalin, and he finally let them leave Russia by way of Persia. In Persia, the British formed the Polish Army under General Anders. It was this group that fought so courageously, losing several thousand lives, but finally were the victors at the top of Mount Cassino. As we drove through the city, the tour guide pointed out interesting homes of famous Soviet artists and writers. The bus then stopped in front of a church. The guide said that it was a Catholic Church in the 19th century. Under Stalin it was converted to a concert hall. The parish school was converted to a school of music. 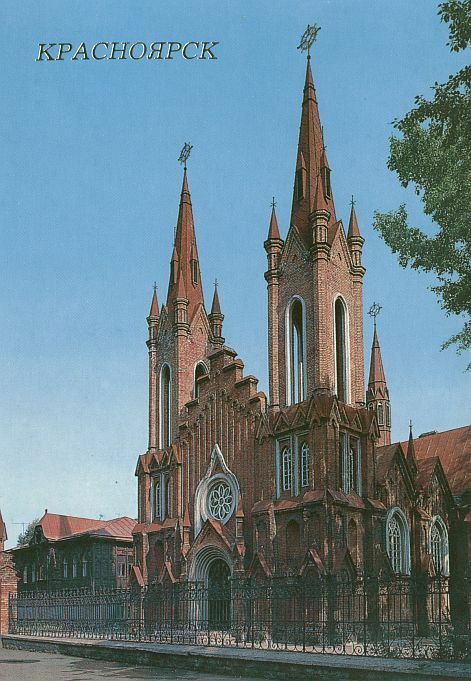 She said that it was now a combination concert hall and Polish Catholic community church on Sundays. The Catholic Church that was turned into a Music School and "Organ Hall"
Wow, she hardly had a chance to finish. The Polish passengers on the bus poured off and crossed the street. Upon entering the church, the first group ran into the priest who was in the rear. They started talking in Polish. The priest was from Poland, and had been there only for 2 months. Catholic masses were conducted in German and Polish every other week. But, they do not have the right to remain in the church when finished with the Mass. The church was still part of the school of music that presented concerts there during the week. The priest said that they were still negotiating in an attempt to have the church returned to the Catholic order. The priest talked with the people for about 30 minutes. I looked around the church while they talked. I noted that the seats were without the usual kneelers. The platform did not have the usual large cross behind it; only a smaller one on a bench. There was a large grand piano just to the right of the altar. A conference table was used as an altar, with the normal Mass items placed on top of it. The stained glass windows had scenes of workers and musical themes. This delay upset our guide, because it was putting us behind schedule. Of the 3 buses on the tour, ours was the only one that stopped. We drove by a very large flea market. Two members of our group wanted to get off there. So, the bus driver obliged. They missed what I would later call the highlight of the tour, the visit to the dam. On the way to the dam, which was about 50 kilometers from Krasnoyarsk, we passed under the rail line of the very famous Trans-Siberian Express. 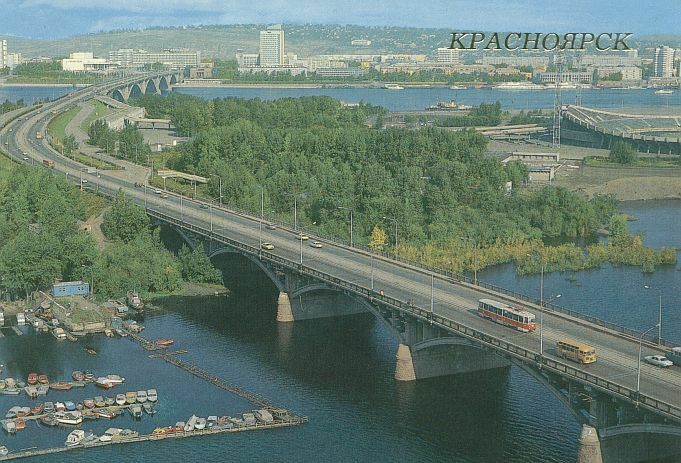 The highway ran alongside the Yenisey River, through many smaller urban areas. At one point on a high plateau, the bus stopped. We all went to the top of the ridge, along a well-maintained concrete walkway to a lookout point. Here, we could see for miles along the river valley. We could see many small farming communities. We could see, and later drove through, two of the communities that were built especially for the people who were displaced from where the new lake was created. We also drove through separate villages that were used by the workers who built the dam. The railroad line from Krasnoyarsk had passenger travel right up the entrance of the dam property. Everyone got off the bus at the parking lot at the dam. Photo taking was prohibited in most such places, per the brochures published by Intourist. But, we were not on an Intourist tour, and no one seemed to care that we were taking photos and videos of every inch of the site. 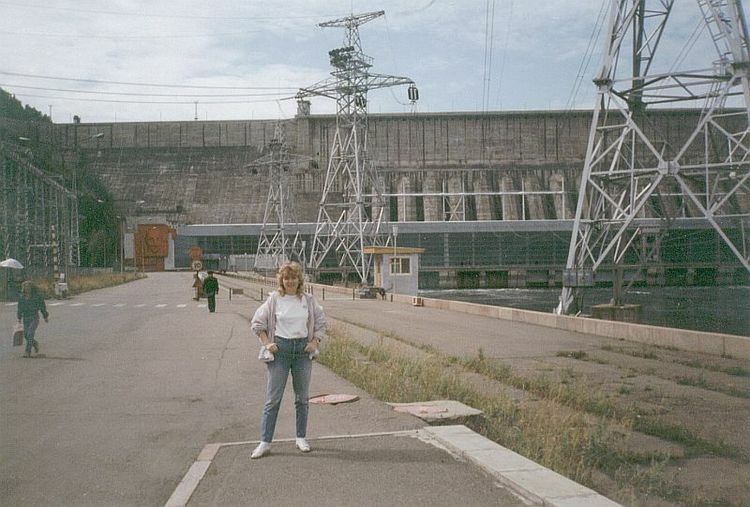 Front side view of the Krasnoyarsk Dam with Danuta in the front. We walked about 100 meters to the first guard post. 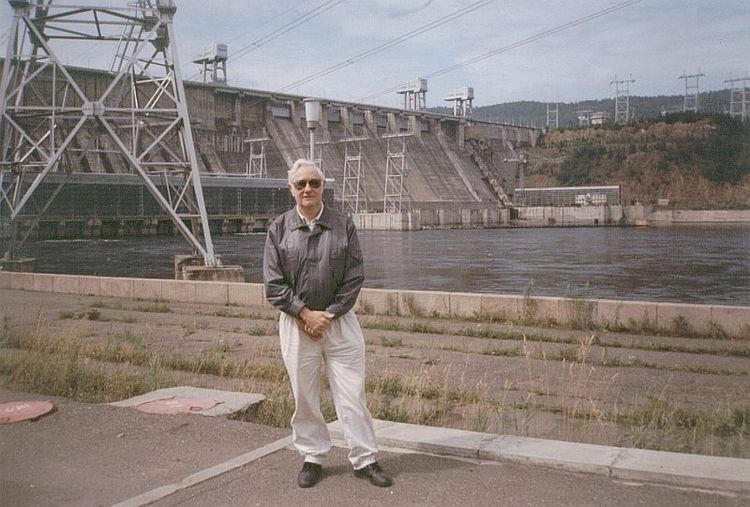 We only waited a few moments for the dam's local guide to come out and start lecturing about the history and use of the dam and power station. As we watched, a special water-driven sled type lift was being propelled upward on the other side of the dam. This was the device that would haul boats and other large equipment up to the top of the dam. The boats were able to get to the lake from the river. The motive power was only of water. The water from the top of the dam would go down a special pipe that went into a cylinder that was pushed upwards. This caused the lift to slide (actually on wheels) up a ramp set at about 30 degrees. We were then taken into the powerhouse and shown the 12 generators. The inside was immaculately clean, and all the generators were humming away. Quite a surprise! There was a large display showing the valley and the lake formed by the dam. On the wall next to it was a large drawing showing the hydroelectric dams, locations of switching centers and the complete layout of emergency switching systems available to assure uninterrupted power would be provided to every point in Siberia. Another wall map showed the power structuring for the entire (then) Soviet Union, including Estonia, Latvia and Lithuania. There were indications of the Atomic power plants on the latter map. Probably as little as 3 years ago, this was out of bounds for anyone not directly connected with the power production in the Soviet Union. One important difference of this dam is that it was built straight across the river. Most dams were built concave (curved) to increase its strength. On the front of the huge office complex, at the entrance to the power house, was a huge portrait of Lenin. After the visit to the dam, we boarded the bus for our return trip to the city and the ship by 1400. We had a late lunch. After lunch, Danuta and I walked around the dock area. Then we walked along the river front to the maritime museum. We walked along another main street past several 12 story apartment buildings. As we passed, we looked into the store windows on their ground floors. We purchased snacks for 4300 Rubles. We returned for dinner and a final night of rest aboard the ship.